I decided that I needed to make granola this week...but I wanted something a little different than the average granola. 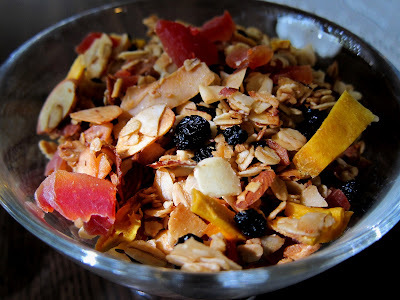 You could probably call this clean out the pantry granola, since I used what I found there...some almonds, coconut, papayas, mango, and blueberries...it was sort of a quasi tropical but somewhat summery combination. Since it was leaning toward tropical with the fruit and coconut, I decided to use coconut oil in place of the typical canola and agave nectar in place of my usual honey. I used almond and vanilla extracts to complement everything, but no coconut, because I did not have any on hand. When I stirred the dried fruit into the finished granola, it turned out to be very lovely with all of the colors in the fruit. The question was, whether or not the granola would meet my standard of approval...and it did! It turned out very tasty, and in fact I ate way too much of it while it was cooling on the pan...it was extremely addictive. Try out this snack, if you like things that are quasi tropical! Line a large baking sheet with non-stick foil, and spray with cooking spray. Preheat the oven to 350 and set rack at the medium position. In a large bowl, combine oats, almonds, and coconut, and set aside. In another bowl, whisk together oil, agave nectar, maple sugar, sea salt, almond and vanilla extracts until well combined, then pour over oat mixture and toss to coat until completely blended. Pour out onto prepared baking sheet, and spread out evenly. Bake for 35 minutes, stirring about every 10 minutes or so until the granola is evenly browned. Remove from oven and let cool. Stir in dried fruit, and enjoy! I just got some coconut oil and I was going to try something like this with Granola Bars. Glad yours turned out well! This sounds good and delicious! Love the fruit combo and wish I had some! Thanks! 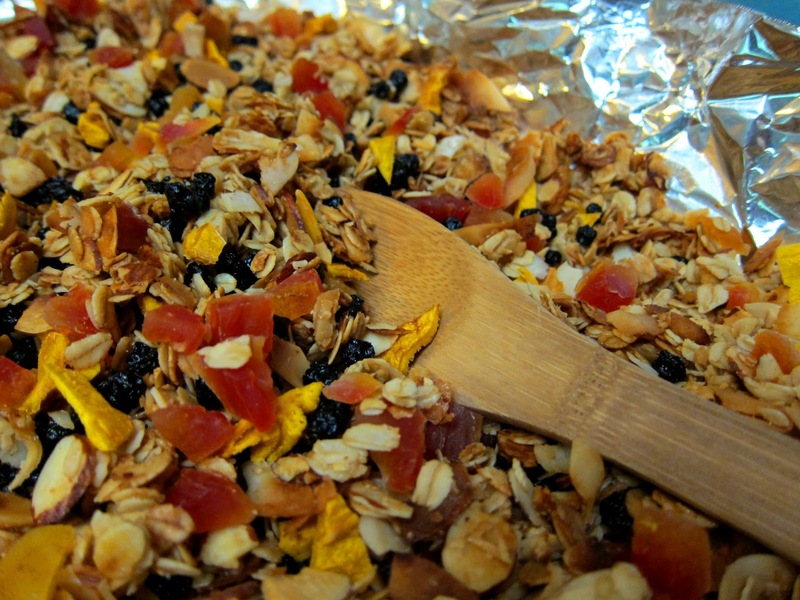 Nice colors and flavors going on in this granola! Ohhh... 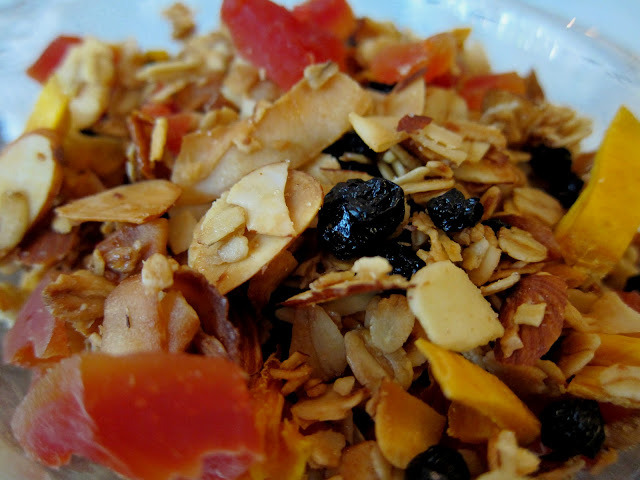 I love homemade granola and this recipe looks absolutely delicious! looks really tasty, i definite must try!